Parasyte was one of the first horror manga I read. I didn't think I'd like it at first since horror wasn't really my 'thing,' but it grew on me and became one of my top-rated series. So I was ready to be disappointed by a mediocre anime adaptation. But guess what - so far it's been fantastic! While the character designs have been changed a bit, and the technology updated (the manga's 25 years old now, so there have to be some changes to make it modern), the story, horrors, thrills, comedy, and pacing are spot on. Migi is their same rational, calculating (yet slightly endearing) self. The animation looks great, and if this keeps up, I can expect interesting existential discussions and awesome action later on. Word of caution: If you don't like gore, and humans morphing into toothy monsters, stay away! This is grisly! Hello. I would to talk about our Holy Badass, Shinichi Izumi. He's made of more steel than the Man of Steel himself. He kills a lot of things sometimes. He also saves his waifu on occasion. I mean, I dunno how to further explain this. Oh wait, I think I do. This anime is freaking insane. From the moment Parasyte starts it hooks you in. It is witty, entertaining, and just down right awesome. The character development is paired great with the action/gore allowing it to pace itself well. Another fantastic thing about this show is the soundtrack, I found it to be really enjoyable. In simple terms if you like Gore, Action, and a good story then this is for you. In a league of it's own. Parasyte is a heavy hitter. This series is nearly flawless. By far one of the best of the late 2014 simulcats, and masterfully blends intense action and suspense with a deep character base. The MC feels very relatable in his circumstances, and the series will consistently keep you pleading for more. Great music, better animation and art style, and devoid of many of the typical character tropes that plague many of today's anime series. Click play. You won't regret it. 16 years of waiting finally paying off. Back in 1997 the manga for this anime was released to North American readers in a magazine, similar to shonen jump, called Mixxzine by a company that would be later called Tokyo Pop. Other manga titles in that were far more popular/well known published in the same magazine were Sailor Moon and Magic Knights Rayearth. 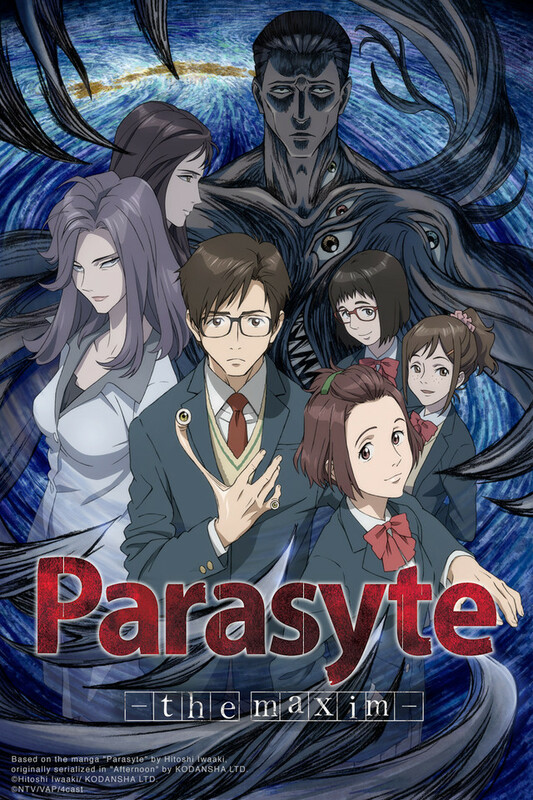 For 16 years I've been waiting to see parasyte released as an anime series and the wait has been totally worth it. There is some changes in order to modernize this series that was released back in 1988 but they don't seem to affect the telling of the story. This is a must watch! Finally after almost giving up hope on 2014, this one managed to shine. Plot , character and concept are engaging and compelling , each episode gives a edge of the seat experience. This isn't for the light hearted , it certainly has a more mature theme which probably explains it's lack of popularity as it isn't like the younger more colorful anime based for the childish audience. There is some light humor and wit mainly expressed by the spock like personality of Migi who speaks only with logic and do away with all human emotions, tied to the main character who is practically the opposition. Without giving any plot away as you can simply read it on wiki, this is certainly one of those titles you may not have heard of a hidden gem and a must watch. 10/10 - A Must Watch! A heartwarming tale of ruthless murder, senseless violence, and the timeless love shared between a man and his right hand. There's an odd charm about watching a bumbling teenage protagonist suddenly sprout eyeballs on random locations over his body, or seeing a man's head suddenly morph into a dozen razor-sharp knives. Jokes aside, this show offers some poignant insights into the human condition and what it means to be alive. It's certainly entertaining all around, and a real roller-coaster of emotion. Oh, Parasyte, I can't quit you! Actually, I was hooked after the opening 10 seconds of the show. GULP. This show is badass and is currently my favorite of the season. And thank god it's not censored to hell and back like Terraformars. So thanks for not treating us like children with this anime, Crunchyroll! This show is great with the laughs, too. The bathroom scene killed me. Literally killed me. Then I was reborn like a phoenix from ashes to sing the praises of Parasyte! I came to this anime without any expectations- all I knew is that I wanted to see something action packed and filled with gore. Ever since season 1 of Tokyo Ghoul was over, I was hungry for more bloody body ripping action, so here I am. At first, it seemed like a very weird opening but a couple of episodes in I'm already begging for more. The true fun doesn't reach until the middle of the season, so don't give up until then.